The Nike Alpha Field General cleats are coming in a hot new colorway for the 2017 season. These mid-high, one piece ankle support lacrosse cleats get their styling from the amazing Nike football family. 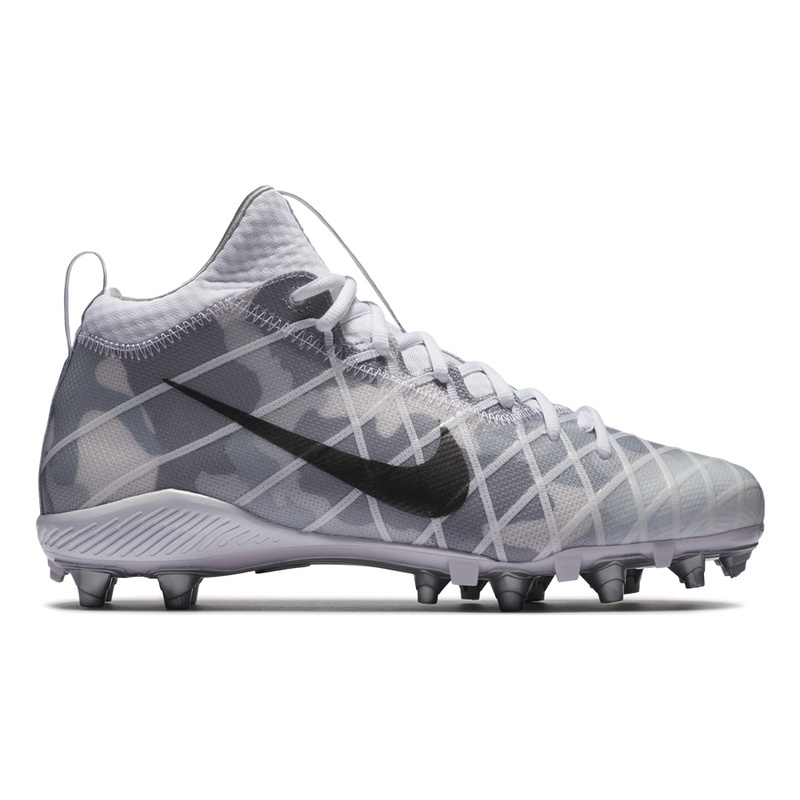 The subtle two tone grey and white camo design looks light grey from a distance with pops of white around the footplate and ankle. Silver bottomed footplate is not flashy or bright metallic like some of their other cleats. We really like the one piece lace up tongue support. These feel like a serious pair of speed slippers when you lace them up. Excellent cutting and sprinting cleat for grass or turf. The new Nike Alpha Field General cleats are one of the coolest new releases for the 2017 season !! Coming soon, these Alpha Field General’s boast a subtle two-tone graphic, silver footplate and white ankle uppers. Chris – crossed support structure in a mid-high with a lockdown feeling designed for turf or field. 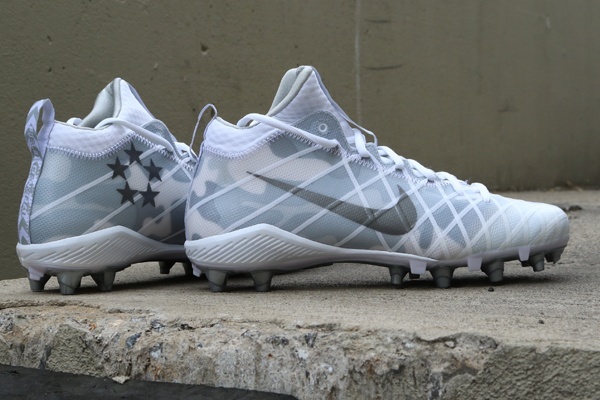 The subtle grey camo pattern on the Field Generals looks like a light grey fading to white from a distance, but on closer inspection, it is a cool mix of camo and high tech one piece tongue support. The upper is actually softer than the sides of the cleat and offers ankle support without that feeling of being fully strapped up the shin. 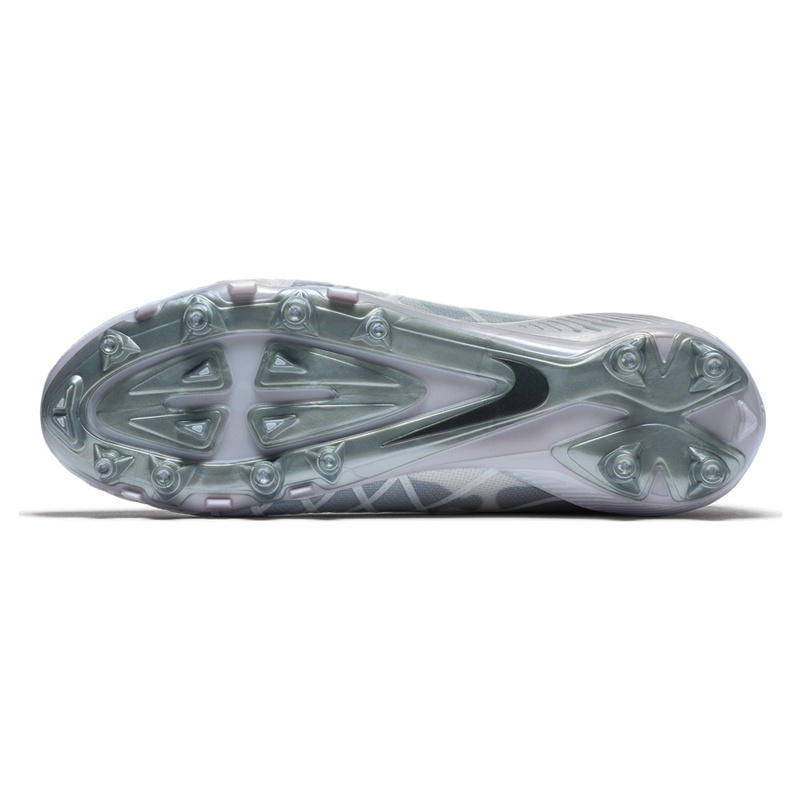 The outside of the cleatshows a dark grey swoosh and the instep features a circular Five Star General pattern. Interior is silver sheen but not flashy. We really like the footplate on this football family of cleats. Aggressive enough for field, but still perfect for turf. The plate is a bit stiff and designed to add extra push and speed to your game when it loads up with flex. The silver bottoms are non metallic and do not give off that bright chrome vibe like some of Nike’s other offerings. These are a subtle, high performance football and lacrosse cleat without a lot of bling, but packed with some really cool new colorways. From a distance, they give an off-white vibe… but people start staring for sure when they get up close. Limited editions here kids !! Get ‘em while they last.